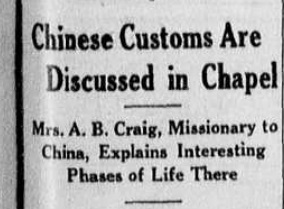 Article "Chinese Customs Are Discussed in Chapel"
This article talks about the speech that a missionary to China by the name of A.B. Craig delivered to Westhampton College students on customs of Chinese culture. She talked about customs such as the colors used for Chinese weddings, Chinese salesmen, and the custom of binding feet. Mrs. A.B. Craig delivered this speech to Westhampton College in order to show positive traits of Chinese culture and customs, as there were many negative beliefs regarding Chinese culture during this time. 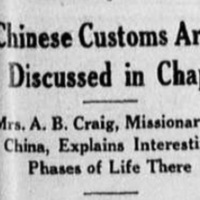 “Article "Chinese Customs Are Discussed in Chapel",” Race & Racism at the University of Richmond, accessed April 18, 2019, https://memory.richmond.edu/items/show/491.